New Delhi: The indigenously developed Pinaka guided rocket system was successfully test fired on Monday at Pokhran desert in Rajasthan, in a boost to artillery capability of the Army, the defence ministry said. The weapon system is equipped with state-of-the-art guidance kit comprising of an advanced navigation and control system. 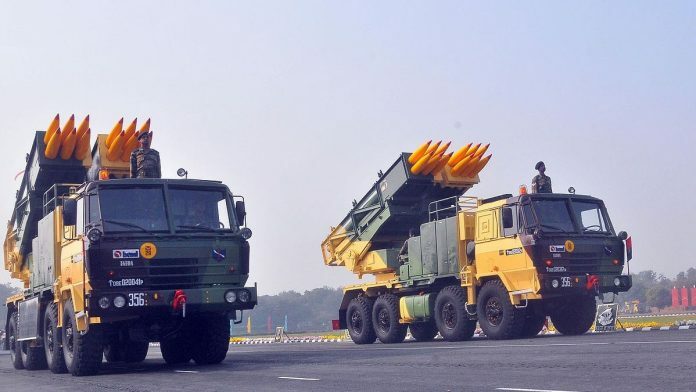 “The indigenously developed guided Pinaka, developed by DRDO, will significantly boost the capability of the artillery to make precision hits,” the defence ministry said. About the tests, it said the weapon systems impacted the intended targets with high precision and achieved desired accuracies. “Telemetry systems tracked and monitored the vehicle all through the flight path. All the mission objectives have been met,” the ministry said.